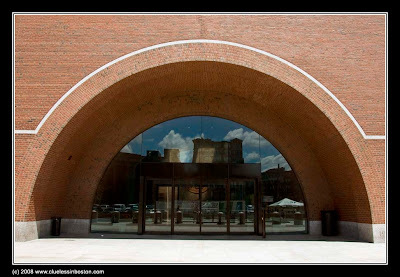 This week's doorway is the John Joseph Moakley U.S. District Courthouse. It's encouraging to see that the court house is not crowded... or is it!!! That's some door with a fabulous reflection too. Nice, and it's brick too! Nice! What an unusual doorway, but very aesthetic and pleasing to the eye. I like the way you composed this picture ... A nice geometry. Boston is a charming city. Been there many times ... always want to come back. The pictures you share here remind me of the places I've been to there and the nice memories I have about the city.